The size and elegance of the Andover 72-inch bathroom double vanity make it perfect for your master bath. It features an antique black finish and decorative carved flourishes, as well as a matching mirror to make a statement in your space. Zero-emissions solid oak hardwood was used to construct this vanity to prevent warping, reduce environmental impact and last for years. To even further ensure the quality of the material, a 12-stage process was used on the wood, including preparing, painting, sanding and hand-finishing. Andover 72-inch Vanity in Antique Black with Marble Vanity Top in Carrera White and Mirrors The size and elegance of the Andover 72-inch bathroom double vanity make it perfect for your master bath. It features an antique black finish and decorative carved flourishes, as well as a matching mirror to make a statement in your space. Zero-emissions solid oak hardwood was used to construct this vanity to prevent warping, reduce environmental impact and last for years. To even further ensure the quality of the material, a 12-stage process was used on the wood, including preparing, painting, sanding and hand-finishing. 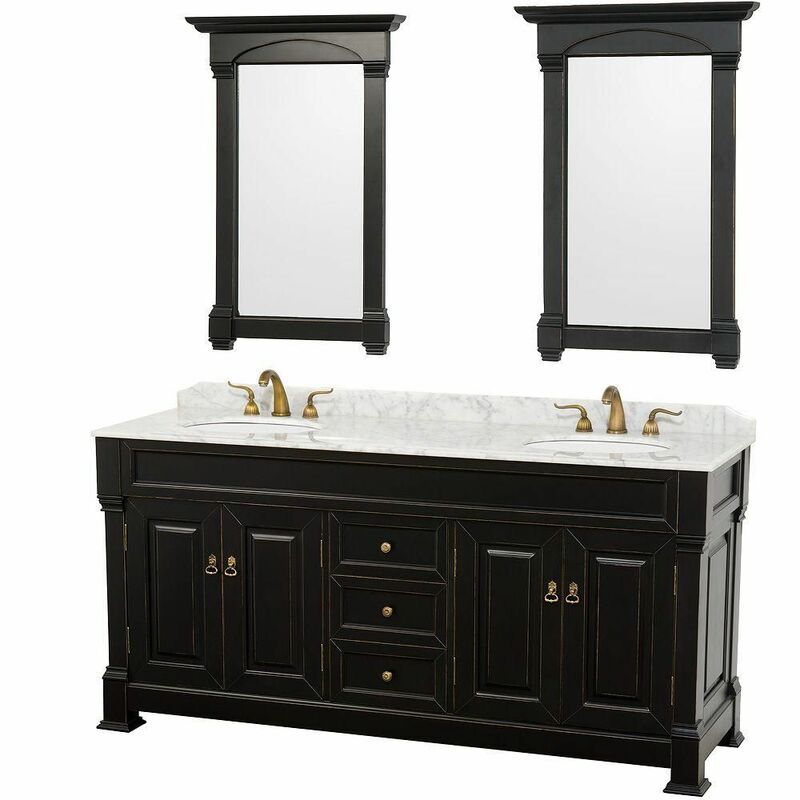 Andover 72-inch Vanity in Antique Black with Marble Vanity Top in Carrera White and Mirrors is rated 4.4 out of 5 by 25. Rated 4 out of 5 by Valorie from Was easy to install in the bathroom but the backsplash... Was easy to install in the bathroom but the backsplash arrived broken. Rated 5 out of 5 by Drp from A beautiful vanity and an amazing value even at full price. We were able to get it at 20% off onl... A beautiful vanity and an amazing value even at full price. We were able to get it at 20% off online. All was included except the faucets. Rated 5 out of 5 by 777 from Absolutely breathtaking. I would highly recommend this vanity for... Absolutely breathtaking. I would highly recommend this vanity for your master bath. Rated 5 out of 5 by Diane from Beautiful!!! ... Beautiful!!! Rated 4 out of 5 by Tammie from Good but doors seem cheap.... Good but doors seem cheap.